Two Into One Will Go is not a controversial book about mathematics―it is about theological controversies that should never have been! Two thousand years ago, God sent His only Son to be the Messiah of Israel and Savior of the world―but since then, He has become the Christ of the Church and a stranger to His own people, the Jews. God gave us a way of life at Mount Sinai that has morphed into two different, separate religions at odds with each other. Christmas and Easter are not biblically commanded Feasts, whereas Passover, Weeks, and Tabernacles are―why does the Church perpetuate the nonbiblical feasts and ignore the God-given ones? Author Michael Cohen is a Jewish man who found his Messiah more than 40 years ago and has spent all those years trying to put his mind at rest as a Jewish-Believer, a Messianic Jew, and a Jewish-born disciple of Yeshua (Jesus). 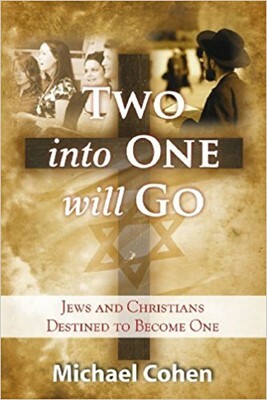 Two Into One Will Go is a distillation of his discoveries and the revelations he has received during this quest. APPENDIX F: JUDAISM AND/OR CHRISTIANITY? NO! THE way! If one plus one equals one, Michael Cohen’s mathematics are an exciting anomaly in the theological world, yet no formula is more current than the Almighty’s intention of uniting the two Judeo-Christian branches of His people into the One New Man, and the “One Stick” of Ezekiel 37. The Hebraic Roots Movement is a phenomenon of our time that has been encapsulated in its historic and prophetic setting in this seminal work, which is part history and part cutting-edge teaching. This book is a well-balanced primer on the current move of the Holy Spirit and should belong in every pastor’s and serious believer’s library. It flows with comfortable empathy for the Jewish people and their noble calling when Zion shall be elevated.